I made a card featuring purple, CASE-ing myself here, joining fellow paper crafters on the Hop to Stop to raise awareness of the issue of domestic violence. I used stamps and inks from Altenew--I just love these peony stamps. 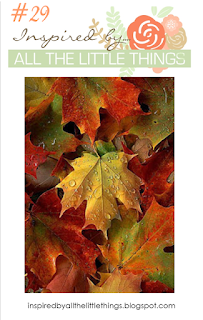 My friends are hosting (Tracey) and guest designing (Kim) over at Inspired by...All the Little Things #29, so I had to squeak in at the last minute and play along. We were given this inspirational photo, and I decided to ink up a brand new stamp set. I loved all those pretty leaves in fall colors--they remind me of what it looked like last weekend in Maine when I went to visit my daughter at college. In a nod to the view out of my window in San Diego, I created a scene with palm trees in fall colors--even some leaves falling off of those palm trees (which also never happens). 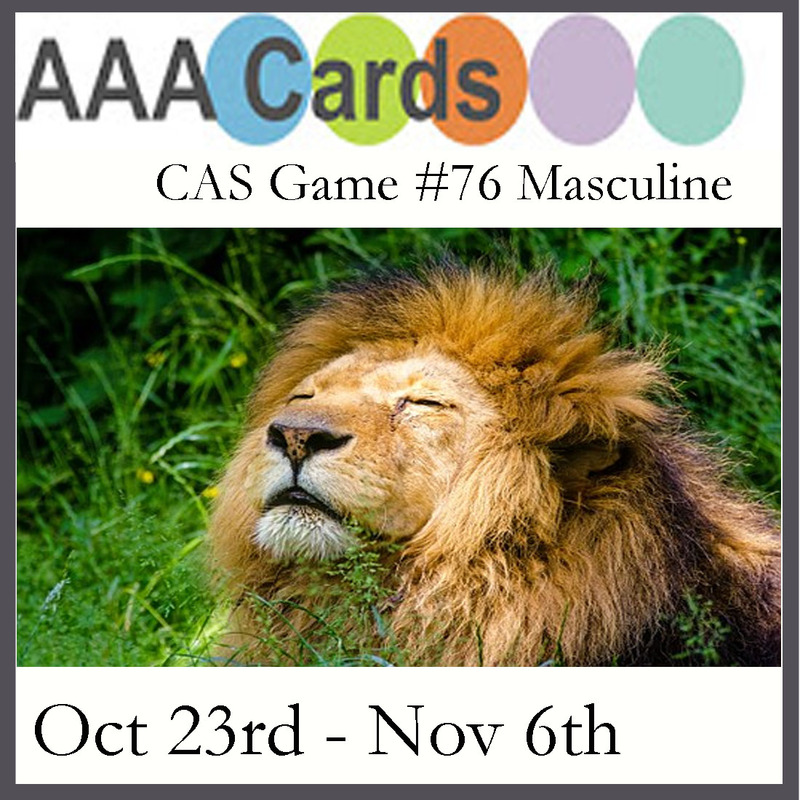 I am also linking this card up at AAA Cards #76, where the theme is masculine, and I also happen to be the Guest Designer this week, Seize the Birthday: Lots of Leaves and Simon Says Monday: Autumn. I love the tropical twist on the Inspired By inspiration photo. It's a great masculine card. 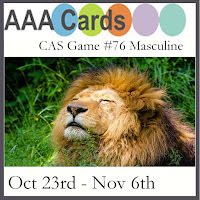 Thanks so much as always for Guesting and also playing with us at AAA Cards! It's always a joy to see your work! Wonderful cards, Joyce! I especially love the first one -- it's gorgeous! Beautiful cards. Love the layout of the first card. The color of the peony is gorgeous. Fabulous cards Joyce! The first is gorgeous!!! Two stunning cards Joyce, love the spotlight colouring. always looks fabulous especially with these flowers. I never tire of looking at beautiful Altenew cards, Joyce. Love the whimsy of your autumn palms. Beautiful designs, as usual, Joyce! So beautiful Joyce....love your stunning birthday card, so amazing. Those soft purple flowers are gorgeous. And your sweet palm trees decked out in fall colors, so stinkin' clever. Your cards are very pretty! I like your selective colouring on the first card. Thank you for supporting this important hop - not an easy subject for anyone but we are bringing it out of the darkness. Oh gosh, Joyce, I LOved CASEing that original myself! This one is also spectacular! I have gone from the forest, to the 'tree' - yes, one tree, in all its glory of Autumn color! I'd feel sorry for myself, but I WILL NOT regret it when I don't have to rake those leaves!!! Joyce two beautiful cards and I LOVE that you got to experience the autumn in Maine and that you were inspired enough to bring it the palms!! Thank you for sharing with us at Inspired by All the Little Things this week! Wow! The coloring on your flowers is simply stunning! You sure know how to work a marker! And I love how you used the autumn color palette on those palm trees. So unexpectedly fun! 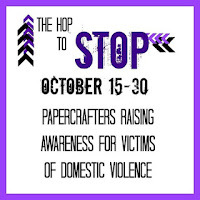 Thank you for joining in the Hop to Stop and helping to raise awareness for victims of domestic violence. This is such a pretty design with parts of the flowers highlighted. Very lovely. Joyce both of your cards are beautiful. I love the pretty peonies, especially using the spotlight technique in purples as you did. The palm tree card is awesome too, love the falling leaves and the woodgrain background. 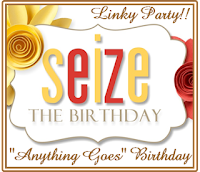 So glad you joined us this week at Seize the Birthday! Love your cards Joyce ! I really love this peony card, it is so elegant and delicate ! And what an original fall card with those palm trees...so different from what we are used to see ! Thanks for sharing. Beautiful both your cards! Love these purple peonies, great CAS! And the second card looks fun! Saw your top card on the Damsel of Distress challenge entry. What an amazing color job & what an amazing way to color it. I wanted to thank you for sharing it! it's Inspired! Both of your cards are beautiful, but the purple flower one is my favorite by far! I love the way you colored only some of the flower! It is an absolutely beautiful card for such an important cause! Gorgeous cards! especially the first one which is fabulous! These are fabulous, Joyce! Your Altenew bloom is gorgeous and I love your fun palm trees! So good that you cased your own card: it is a beauty!